I hate playing favorites (because, moderation, people), and it’s important to mix things up, but I freaking love coconut oil. And I use it all the time. For things you wouldn’t even imagine. It’s of course a dream for cooking because it has a high smoking point (which means it can get screaming hot before it burns)—so you can easily achieve a perfect fry, crust, or crisp. But, didja know, it’s also rather helpful around the house? And indulgent to sneak into your self-care routine, too? Virgin – from the meat of the coconut (no chemicals used to extract it) – has a strong coconut taste. Refined Coconut Oil – has least ‘coconutty’ flavor but isn’t the purest option. Be sure it’s expeller pressed (a natural way to extract the oil that doesn’t involve weird chemicals). 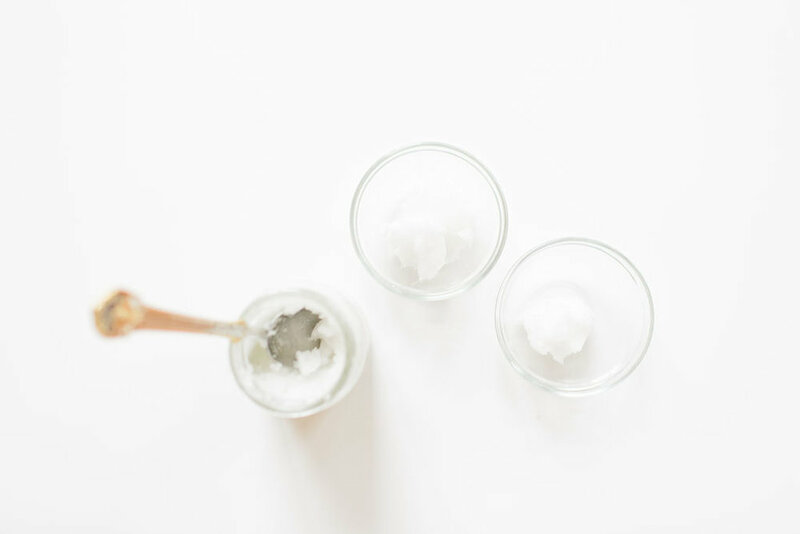 Liquid coconut oil – nice that it’s always pourable, but getting that texture means you’re sacrificing a lot of the natural goodness in coconut oil. Fried Tortillas: Any time we make tacos, quesadillas, or shakshuka, I always prepare the tortillas this way, and they always make the meal. Warm about 2-3 TBS of coconut oil in a cast iron over medium high heat. Once it’s almost smoking, add a tortilla then flip with tongs after about 30 seconds. Repeat with remaining tortillas and add more oil to the pan as necessary (note: if you’re frying several, the pan will get significantly hotter and the tortillas will start cooking much faster—about 15 seconds per side). Fried Eggs: Similar to technique above, warm 2 TBS of coconut oil in cast iron over medium high heat. Crack egg into a small bowl, then gently drop it onto the oil-covered pan. It’s important the oil is hot before you start cooking the egg because the heat will start to cook it immediately and help retain the egg’s shape. Coconut Coffee: This is a favorite weekday treat (and the fat from the coconut oil keeps you energized until lunch!) Get the recipe here. Moisturizer: In a pinch, I’ll rub a little coconut oil into my bare face to moisturize. It can be a little heavy for some skin types, so avoid any naturally oily areas of your skin. I love that I can get a quick little “I’m alive!” glow without having to put on any makeup. Remove Jar Labels: Soak the jar in warm soapy water and rub off as much of the label as you can. Rub a small amount of coconut oil (doesn’t need to be the good organic stuff!) onto the remaining label and let sit for a few minutes. Scrape away as much as you can and repeat the process. Season a Cast Iron: After cleaning a cast iron with water (and salt if there’s excess gunk to remove) rub a tablespoon of coconut oil into the surface. Finish by heating the pan in a low-temp oven for about 30 minutes, then letting it cool completely before storing in a cupboard. Makeup remover: Put a tab on a cotton pad and swipe over eyes to remove eyeliner and mascara.